Free Printable September 2019 Calendar. Need a blank calendar to write important things to do this month? 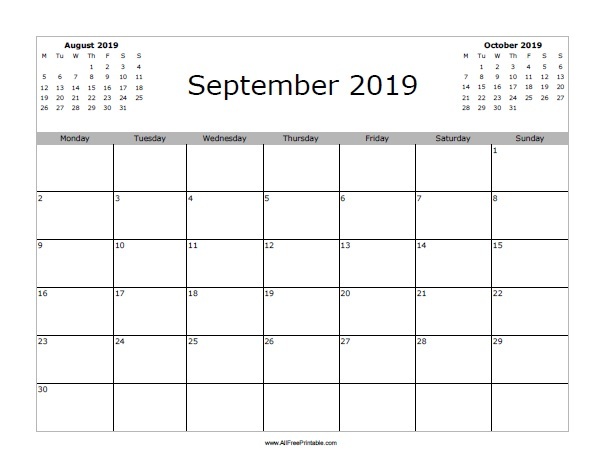 Print this free September 2019 calendar to get organized. Great free printable calendar to use at home, school, church, non profit organizations, business. Our free printable September 2019 calendar includes previous month August and next month October. Select from 2 printable options starting the week on Monday or Sunday. Use the free printable September 2019 calendar to write notes and things to do in September 2019 like holidays, medications log, school activities, birthdays, exercise plan, important phone calls to make, messages, things to do at work and more. Click the link of your choice to download or print now.